Citation: Swan AM, Aye ZN, Aung T, et al. New insight and methadology of long lasting successful reduction in overweight and obesity in USA. Arch Gen Intern Med. 2018;2(1):16-19. With regards to overweight and obesity, either in childhood or adulthood patients, it seems to me that almost all dietary guidelines, recommendations, and techniques are not adequately helpful in the weight loss battle. It is also apparent that all dietitians, weight loss specialists, and doctors are facing a high failure rate in their patients’ weight loss management programs. Therefore, it is no wonder that after ten years of trying to follow these particular guidelines and recommendations, the outcomes proved to be unsuccessful. I believe that a new mindset needs to be tested against the traditional philosophy and methods. After ten years of following the current guidelines and trends of weight loss in my own practice, I witnessed dismal results myself in trying to assist patients in their weight loss goals. As a result, I gave up all my efforts based on the traditional guidelines 20 years ago. Since then, I conducted personal studies about weight control techniques for healthy weight loss and weight gain and also unhealthy weight loss and weight gain. I made my postulations and later tested them against my hypothesis. I was astonished to achieve the substantial results of a 99.9 percent success rate in weight control. This is hard to believe since it occurred against the shared beliefs and theories. In place of that, I am planning to publish the findings of the last 20 years of my private research very soon. Obesity is a common and preventable disease of clinical and public health importance . It is often a significant risk factor for the development of several non-communicable diseases, significant disability and premature death . The obesity prevalence in the United States has increased significantly during the last few decades according to Center for Disease Control (CDC) reports (cite2). Obesity has become a leading risk factor for many adverse health outcomes including type 2 diabetes, hypertension, dyslipidemia, coronary heart disease, and certain types of cancer . Moreover, the Standard American Diet (SAD) has long been implicated in contributing to the health challenges experienced in the US . Consequently, significant changes to the SAD have occurred since the 1950s, including a higher abundance and accessibility to calorie-dense and nutrient-poor food and beverage choices . The typical SAD is high on processed junk food, meat, fat, dairy, refined sugars, and sodium intake. Obesity is defined as a condition of abnormal or excessive fat accumulation in adipose tissue, to the extent that health is impaired . Center for Disease Control (CDC) describes obesity or overweight as a weight that is higher than what is considered as a healthy weight for a given height. The body mass index (BMI) is the metric currently in use for defining anthropometric height/weight characteristics in adults and for classifying them into low risk or healthy and high risk or unhealthy groups . It is also widely used as a risk factor for the development of or the prevalence of several health issues . Generally, an adult who has a BMI of 25-29.9 is considered overweight, and an adult who has a BMI over 30 is considered obese. A BMI of 18.5-24.9 is considered normal weight. Current evidence indicates there is a wide range of BMIs over which mortality risk is modest, and this is age related . Weight reduction and maintenance approaches include lifestyle changes, exercise, dietary and behavioral therapy, pharmacological interventions, and surgery. Although physical exercise has been encouraged by most authorities, it may increase the risk of injury and fall, especially in the elderly population. Also, most pharmacological and surgical interventions have higher cost and adverse events with similar failure rates to other approaches in the long run. Thus, we focus on the dietary approach which is more feasible and applicable to almost everyone. Many have tried a myriad of modifications to the components of food or the type of energy source to achieve targeted weight. Among the weight loss diets, low carbohydrate diets or low-carb diets such as Atkins diet and Dukan diet are popular and scientifically proven to be useful for obese and overweight individuals [6,7]. Energy-restricted very low-carbohydrate ketogenic diet (VLCKD) is by far seems to be the most effective approach to weight reduction [8-11]. Hundreds of patients have achieved their target weight within a short period safely and able to maintain their weight for the long term as well. Here, we would like to present four notable cases treated at our outpatient clinic who have been benefited from VLCKD. The first patient, denoted as Patient A, is a 60 years old, African American man who used to weigh over 400 pounds at the height of 65 inches which makes the BMI of more than 60 when he first visited our clinic before 2000. He has metabolic syndrome, ischemic heart disease and arrhythmia with intracardiac defibrillator since 2009. He developed renal failure lately and was dependent on hemodialysis since September 2015 . In addition to standard comprehensive care, we encouraged him to use the very low-carbohydrate diet . Then, his weight plummeted at the beginning months to over 300 pounds, then gradually declined below 300 during the following years. See Figures 1a, b and 2a, b. Figure 1a. 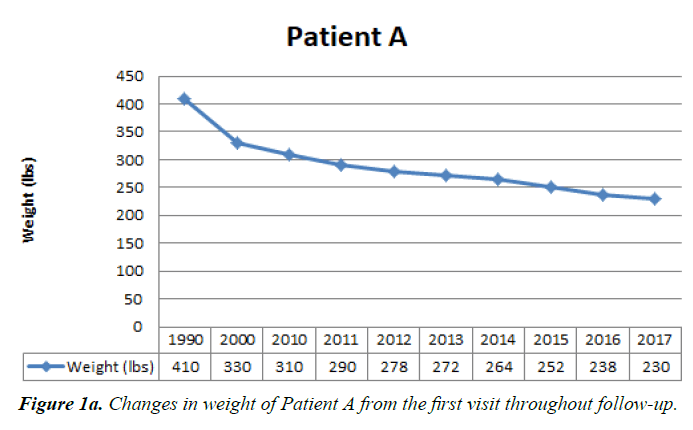 Changes in weight of Patient A from the first visit throughout follow-up. Figure 1b. 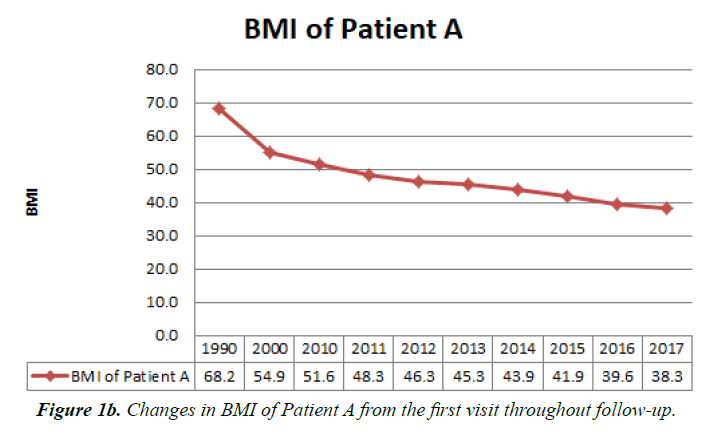 Changes in BMI of Patient A from the first visit throughout follow-up. Figure 2a. 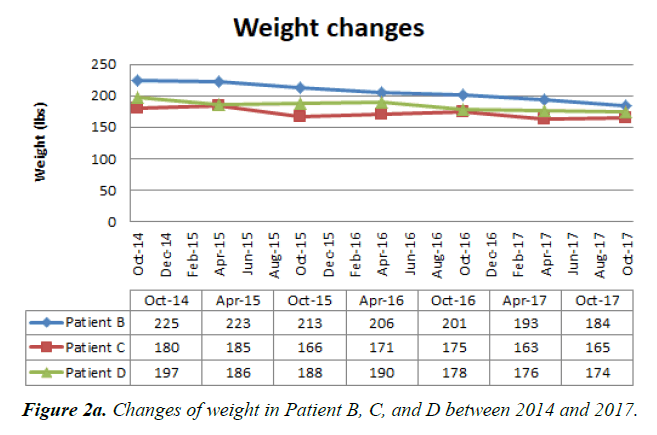 Changes of weight in Patient B, C, and D between 2014 and 2017. Figure 2b. 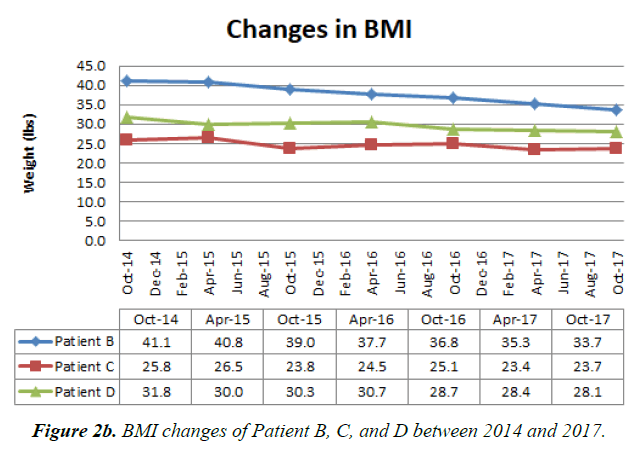 BMI changes of Patient B, C, and D between 2014 and 2017. Patient B is a 63 years old African American woman with a past medical history of hypertension, borderline diabetes, hemodialysis-dependent chronic kidney disease, hypothyroidism and mild schizophrenia. She is 62 inches tall and had a BMI of more than 40 but dwindled to near 30 within the last three years. Patient C is a 59 years old Asian male with past medical history of diabetes mellitus, hypertension, dyslipidemia, and end-stage renal disease dependent on hemodialysis . He is 70 inches tall and had BMI over 30 when he first visited our clinic five years ago. Then, he was able to achieve weight loss in the subsequent years and gently approached a healthy BMI in the last three years. Patient D is a 54 years old Hispanic American male with past medical history of diabetes mellitus, ESRD, CAD with coronary stents, hyperlipidemia, peripheral vascular disease, carotid artery stenosis, restrictive lung disease, obstructive sleep apnea and Chronic Kidney Disease. It should be noted that Patient D was given regular corticotropin (ACTH) injection since early 2015, but, he was able to control the weight throughout the follow-up. Our fat-loss diet is a very low-carbohydrate ketogenic diet (VLCKD)  with some minor variations on the macronutrient composition from other popular low-carb ketogenic diets such as Atkins diet and Dukan diet . This new diet consists of consuming all kinds of beans, white meat (such as chicken breast), fish, salad, and vegetables. If the food is to be fried, only olive oil is allowed to be used. Black coffee is permitted in the morning and the afternoon. It is imperative to avoid fruit, juice, soda, dairy products, chicken leg and wings, complex carbohydrates (such as rice, pasta, potatoes, bread), processed foods and red meat. We advise the patient to practice on two steps. The first step can be described as an intensive or critical phase which includes restriction of carbohydrate to zero or minimal for the first three months. The calorie intake is also recommended to be less than 1000 kilocalories per day. We do not recommend physical exercise and activity during the intensive phase. When the target BMI or more than 20% of weight loss is achieved, we reintroduce the carbohydrate gradually and the calorie intake to keep around 1000 kcal/day depending on the energy expenditure of the individual. Although the diet can be applied to the majority of patients with overweight or obesity, we discourage to use on patients with inborn errors of metabolism, particularly on urea cycle . We screened patients by observing baseline metabolic profile including serum ammonia and acidity before the diet is introduced. We also exclude patients using sulfonylurea and insulin which may counteract the glycogenolysis and ketogenesis created by our dietary approach. We educated the patients about the benefits of following the diet we suggest, and the overall advantages in health that he/ she will gain when lifestyle modifications are taken into place. Then, we proposed the specific types of macronutrients with little to zero carbohydrates and the calorie amount to consume per day. However, the choice is considerably broad and flexible so that patient of any cultural and ethnic background can follow. We followed up the patients weekly and monitored weight during the first three months and then monthly interval to encourage weight maintenance. Only a few of our patients reported minor complications such as changes in bowel habit mainly constipation, headache and occasional weakness and those conditions were easily managed accordingly with other drugs and supplements. If patients implement a healthier lifestyle at home, many obesity issues could be avoided. The major challenge of weight reduction is the maintenance of weight rather than achieving a target weight loss. The behavioral change and the adherence to the diet are quintessential for the successful weight reduction and maintenance. All of our cases presented here are older adults and elderly with several comorbidities which make them unfeasible to other weight loss strategies such as physical exercise and bariatric surgery. Nevertheless, the patients have proved a significant weight loss and maintenance on the very low-carbohydrate diet with or without drug therapy such as liraglutide over the course of three years follow-up. Despite all the comorbid diseases and complications, our patients appear to live longer with fewer complications. A larger scale study for the long-term benefit of very-low-carbohydrate diet and head to head comparison studies with other dietary approaches are recommended to handle the emerging outbreak of overweight and obesity. Ofei F. Obesity - A preventable disease. Ghana Med J. 2005;39(3):98-101. Centers for Disease Control and Prevention. National Center for Chronic Disease Prevention and Health Promotion, Division of Nutrition, Physical Activity, and Obesity. Data, Trend and Maps. Accessed Dec 30, 2017. An R. Prevalence and trends of adult obesity in the US, 1999–2012. International Scholarly Research Notices. 2014;1-6. Grotto D, Zied E. The standard American diet and its relationship to the health status of Americans. SAGE J. 2010;25(6). Nutall FQ. Body mass index: Obesity, BMI, and health: A Critical review. Nutrition Today. 2015;50(3):117-28. Paoli A, Rubini A, Volek JS, et al. Beyond weight loss: a review of the therapeutic uses of very-low-carbohydrate (ketogenic) diets. Eur J Clinical Nutrition. 2013;67(8):789-96. Gupta L, Khandelwal D, Kalra S, et al. Ketogenic diet in endocrine disorders: Current perspectives. J Postgraduate Med. 2017;63(4):242. Volek JS, Sharman MJ, Gómez AL, et al. Comparison of energy-restricted very low-carbohydrate and low-fat diets on weight loss and body composition in overweight men and women. Nutrition & Metabolism. 2004;1(1):13. Gower BA, Goss AM. A Lower-Carbohydrate, Higher-Fat Diet Reduces Abdominal and Intermuscular Fat and Increases Insulin Sensitivity in Adults at Risk of Type 2 Diabetes-3. The Journal of nutrition. 2014;145(1):177S-83S. Yancy WS, Olsen MK, Guyton JR, et al. A low-carbohydrate, ketogenic diet versus a low-fat diet to treat obesity and hyperlipidemia A randomized, controlled trial. Annals of Internal Medicine. 2004;140(10):769-77. Brehm BJ, Seeley RJ, Daniels SR, et al. A randomized trial comparing a very low carbohydrate diet and a calorie-restricted low fat diet on body weight and cardiovascular risk factors in healthy women. The J Clinical Endocrinology & Metabolism. 2003;88(4):1617-23. Grimaldi M, Ciano O, Manzo M, et al. Intensive dietary intervention promoting the Mediterranean diet in people with high cardiometabolic risk: a non-randomized study. Acta diabetologica. 2017;1-8. Clifton PM, Condo D, Keogh JB. Long term weight maintenance after advice to consume low carbohydrate, higher protein diets-a systematic review and meta analysis. Nutrition, Metabolism and Cardiovascular Diseases. 2014;24(3):224-35. Aggarwal BB, Harikumar KB. Potential therapeutic effects of curcumin, the anti-inflammatory agent, against neurodegenerative, cardiovascular, pulmonary, metabolic, autoimmune and neoplastic diseases. The Inter J Biochemistry & Cell Biology. 2009;41(1):40-59. Colica C, Merra G, Gasbarrini A, et al. Efficacy and safety of very-low-calorie ketogenic diet: a double blind randomized crossover study. Eur Review for Medical and Pharmac Sci. 2017;21:2274-89. Chang JJ, Bena J, Kannan S, et al. Limited Carbohydrate Refeeding Instruction for Long-Term Weight Maintenance Following a Ketogenic, Very-Low-Calorie Meal Plan. Endocrine Practice. 2017. Westman EC, Feinman RD, Mavropoulos JC, et al. Low-carbohydrate nutrition and metabolism. The American journal of clinical nutrition. 2007;86(2):276-84.